Most Galactic TeV gamma-ray sources are extended objects; the few point-like sources are either very distant or objects where the young age of the source or strong radiation fields or magnetic fields prevent significant propagation of particles. Binary systems, where a neutron star or stellar-mass black hole orbits a massive star with a strong radiation field, hence tend to appear as point sources. When the point source HESS J0632+057 was discovered (Aharonian et al. 2007, SOM Feb. 2007) near the Monocerus Loop and the Rosette Nebula (top image), it was suspected to represent a binary system (Hinton et al. 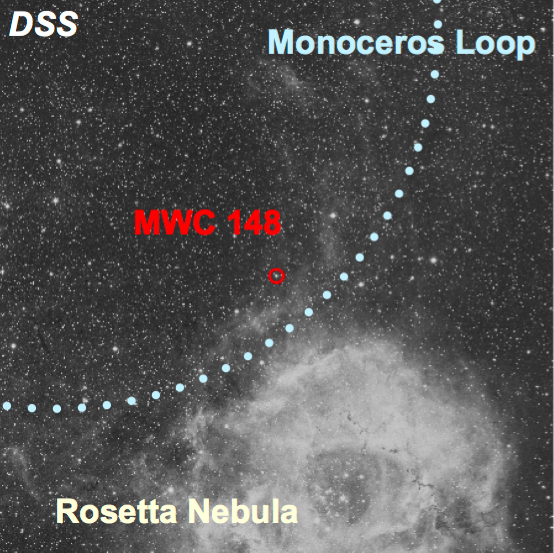 2009), in particular since its location coincided with the massive star MWC 148 and its wide-band emission spectrum resembled that of other binaries. However, confirming this hypothesis turned out to be quite a challenge. Binaries should be characterized by variable and periodic emission, and indeed first evidence for variability in gamma rays and X-rays was found by Acciari et al. in 2009. A variable radio counterpart was also detected by Skilton et al.. Yet, no indication for periodic variability could be found on time scales of days to months (Falcone et al. 2010), and optical photometric and spectroscopic observations did not reveal significant variability or radial motion of the massive star suspected as the companion (Aragona et al. 2010, Casares et al. 2011). In 2011, the VERITAS and MAGIC gamma-ray telescopes reported increased activity of HESS J0632+057 (Ong et al. and Mariotti et al.). Finally, the long-term X-ray observations with SWIFT succeeded in confirming the nature of HESS J0632+057: Bongiorno et al. 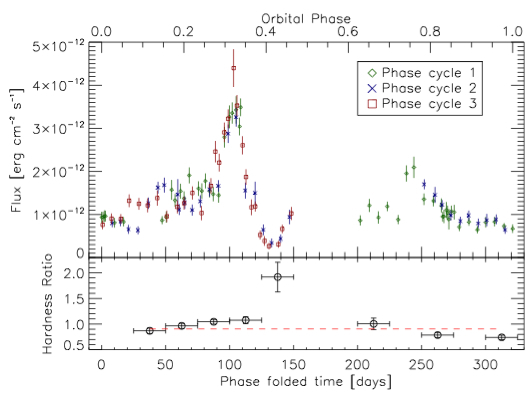 (2011) presented strong evidence for periodic X-ray variability with a very long period of 321+-5 days, observed over 3 periods (Fig. 1, Fig. 2). The long period had made this discovery difficult and time consuming, requiring significant perseverance by the observers in the various wavebands. Both the gamma-ray and X-ray light curves are complex (Fig. 2) and (Fig. 3). 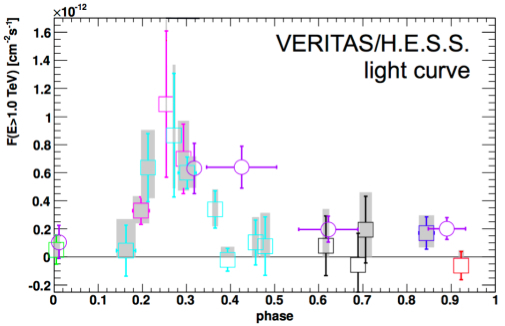 The TeV light curve combining H.E.S.S. and VERITAS data was first shown at the International Cosmic Ray Conference in 2011 (Maier et al.) and exhibits a strong peak at orbital phase around 0.3. HESS J0632+057 is the first binary discovered on the basis of TeV observations.